My brother came to visit me this week, and we were reminiscing about our childhood. More specifically, Halloween, trick-or-treating, and candy. Lots and lots of candy. While currently the bro and I wholeheartedly embrace a more “natural” lifestyle (okay, okay… we are pretty much card-carrying hippies), as children we were pretty typical. We played Power Rangers in the front yard, made forts out of furniture, loved getting McDonald’s McFlurrys, and collecting gobs of Halloween candy. Pillowcases full of sugar. Nowadays, we don’t really lose our composure at the sight of a Snickers bar, but we do still enjoy a good chocolate treat. Here’s a really easy way to make a candy-like confection that’s acceptable to your taste buds as well as your blood sugar. On the stove top, make a double boiler by heating water in a small pot and topping with a metal bowl. Make sure the bowl fits on top of the pot, no gaps. Add chocolate and butter/shortening to the bowl and stir until melted. 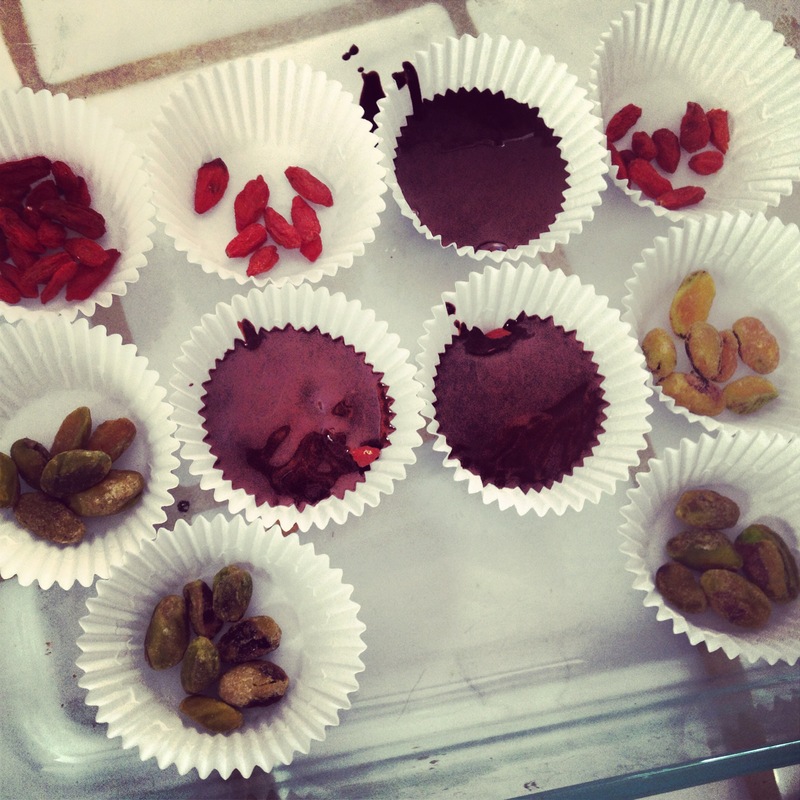 Add fix-ins to your baking cups and spoon in melted chocolate.